Esquire labelography, from my personal collection. The “Decca” outer rim deep groove fairly consistent up to around 32-078, replaced by a different but equally, consistent stamper centre die impression on the remainder of the series. Viewed at full screen on desktop monitor 2,000 pixel wide, each label should still be readable. Not smartphone or tablet recommended.. 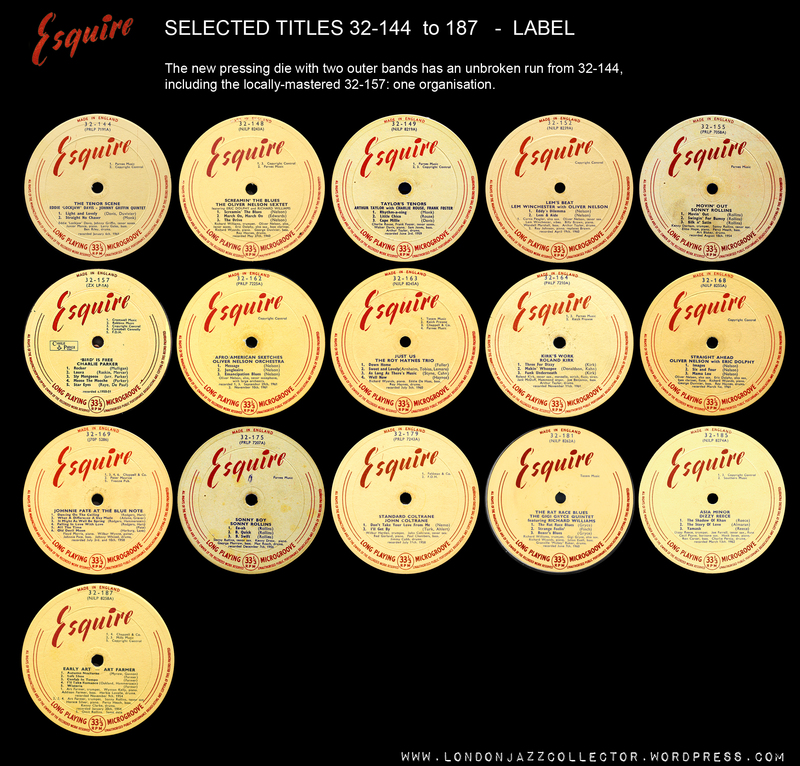 The first outer rim deep groove is consistent with Decca pressings for other labels of the period, such as London American Crimson Silver series. The second pattern die remains an open question. 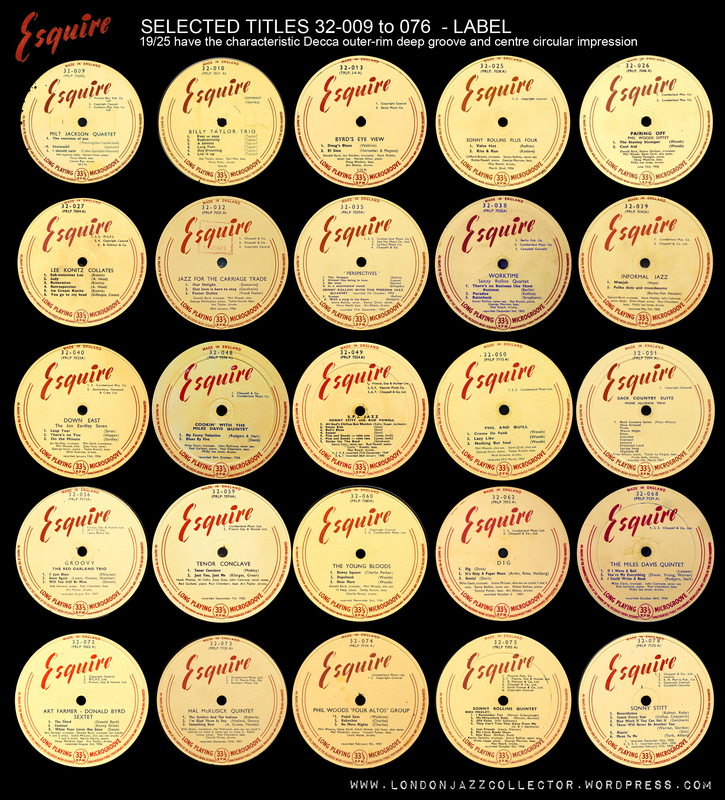 Inner sleeve of Decca style, for at least part of the Esquire series. A strong Decca connection, but not 100% consistently. 92 is good going, you are way ahead of me. I’ve had this long term interest in Decca pressings though, so I pulled out one of the two you mention, the Parker 32 157, and yes it has the A1 B2 stamper endings, but it’s what is not there that has me puzzled. A 50’s decca with no pancake or more common deep groove to the labels?. Then there’s all the missing bits from decca run out grooves compass points, i.e “The lacquer number is at the 6 o’clock position immediately after the tape sequence number (the letter after the number is for the mastering engineer). At the 9 o’clock position is the mother number and at the 3 o’clock position is the stamper using the word B U C K I N G H A M to represent the numbers 1 thru 10. 11 is BB, 12 is BU….” (to quote Sedrick Harris). I’ve just noticed though that this one is credited to Charlie Parker records – so maybe directly from their master? Circumstantial but the outer rim deep groove looks consistent with other Decca labels of the late fifties. 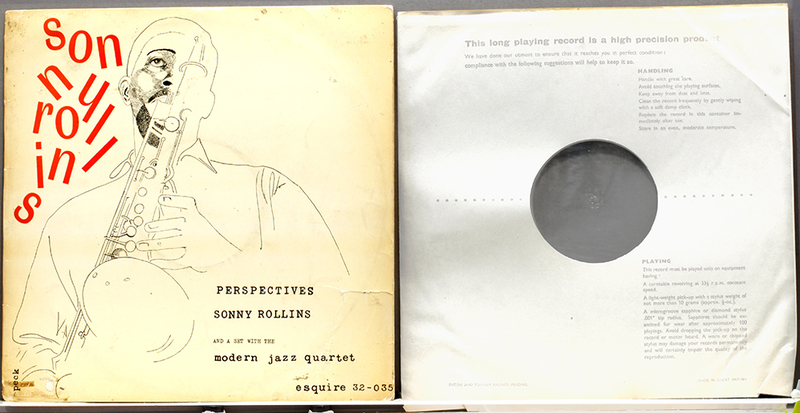 The inner sleeve with some Esquires also points to the Decca connection, but not consistently. Quite possibly there are other releases from outside the Prestige fold, and Parker would be likely one. Growing fonder of these the older I get. I see you have a 32-074, 4 Altos label in there, but no hyperlink to it in the other Phil Woods listing. Listening to it now, a great, even exciting record in places, with the order of soloists at times maddeningly difficult to guess, with the unison work a delight. Is yours a clean copy, did you get a good deal on it? I haven’t even put this one on the cleaning machine, and it plays with a silent background, with a lovely tone and balance even on my modest Ortofon mono cart. By coincidence, I picked up a copy of the september 1959 Jazz Monthly, which reviews it, but as is common in older jazz magazines, they frequently write snootily about all modern jazz records. RVG stamped dead wax, so presumably from US metalware?. Have you ever noticed when these UK Decca pressings are decca mastered for esquires? Occasionally I overlook inserting a link, thanks, I’ll check out the post. Of course there may be others among those I don’t have. All my Esquires are pretty well “clean”. I tolerate the odd surface noise, but nothing repetitive beyond three or four clicks. I love them because they circumvent the manufacture issues in some Prestige and New Jazz originals, (recycled vinyl) and anything with RVG mastering is welcome chez LJC. Unlike the original music, the standard of popular music criticism of the period is generally fairly shallow, mostly to be ignored. Exceptions are Whitney Balliett who is God, Nat Hentoff (who died in the last few days) Leonard Feather, and a few others of the time stand out as understanding the men and the music.